The use of greenhouses to grow plants has a long history. The cannabis industry is helping revolutionize them which is good for both the market and the environment. While the dawn of the medical cannabis age began in California around 1996, the early 2000s saw the first of several green rushes that brought droves of budding growers to the hills of Northern California to try and stake a claim and strike it rich. A majority of the sungrown herb from that era was full-season, traditional cannabis. A grower would plant outdoors in May and harvest in September or October, like farmers have for millennia. The small amount of greenhouses that was seen during this time was not really that much different from its full sungrown sisters. But, around 2005, the first of a new type of greenhouse bud began to hit the shelves of dispensaries — bud that rivaled the density and potency of indoor. The era of light-deprivation (AKA “light dep”) had begun. As the light dep style of growing became more popular, the traditional long season use of greenhouses was almost entirely replaced. The current model that most growers follow is to grow one light dep crop planted in April or May and harvested in July/August. Some enterprising growers start and harvest even earlier, aided but supplemental lighting and heaters. The use of greenhouses to grow plants has a storied history dating back to at least the Roman Empire. Early horticulturists planted vegetables on wheeled carts, rolling them out into the morning sun and housed them at night under primitive glass-roof enclosures. During the 1700s, the French grew oranges in glass-covered buildings. But it was the ever-inventive Dutch who first really mastered the greenhouse concept and continue to lead the way today. Holland produces millions of kilograms of vegetables and flowers a year, with structures that cover many acres and employ fully automated systems. In the 1960s, U.S. agriculture saw a massive expansion of greenhouse technology when wider length sheets of polyethylene film became available and acted as a relatively less expensive covering than glass. Structures like hoop houses – basically bent steel or aluminum frames, which was later replaced by PVC tubing – first started to be used by flower and vegetable growers in mainstream agriculture. Growing cannabis in greenhouses dates back to at least the early 1970s, although some enterprising souls might have been employing them earlier. Some will remember the scene in Cheech and Chong’s “Nice Dreams,” where the duo scores bud from a mad scientist who has a huge greenhouse masquerading as a swimming pool. Initially, most greenhouses were used in this way to avoid aerial detection of the massive, mostly landrace sativas that were being grown in the U.S.
As the intensity of the Campaign Against Marijuana Planting (CAMP) and other cannabis eradication operations increased, covert greenhouses had the reverse effect of calling attention to authorities rather than camouflaging against them. By the mid-1990s, very little commercially available cannabis was being grown in greenhouses, as growers were being driven deeper into the woods for cover. Cultivators were forced to hide their plants in small, widely scattered plots that yielded small and very expensive flowers. This was the era where ganja and gold brought the same price per pound at market. The first greenhouse light deps were almost exclusively of the hoop house style, ranging from 4 to 10 feet in height at center point and covered with polyethylene film, which allows light to penetrate, but protects the plants from wind, rain, critters and other unwanted elements. There were several reasons why light dep greenhouse practices became popular. The primary upside was that now instead of having just one crop a year — a budgeting nightmare at best due to having all the year’s eggs in one basket — you could harvest twice per year between May and October. That way, if you had a disaster with one crop, you could still recover your investment with the second. Also, by growing smaller plants, the buds frequently came out looking more cosmetically appealing. Lastly, the grower could more closely control an enclosed, light-deprived environment, which meant a much better final product. With this method, flowering can be induced whenever the grower chooses, as long as plants have reached a sufficient size to produce good buds. The only limiting factor to how early plants may be planted is temperature, which many cultivators deal with by heating their greenhouses. The crucial element in this style of light dep is the regularity of the light cycle. Cannabis reacts to dark, not light, and it’s for this reason that outdoor cannabis begins to flower as the days of summer shorten. The light dep method artificially induces flowering by covering the greenhouse with a dark black cloth. Cannabis plants are very sensitive — hardy but sensitive — and if the dark cycle varies by even a few minutes, it will affect the final product. Anyone using self-pulled blackout sheathing (as opposed to an automated system) has to be extremely rigorous about getting them covered at the same time every day. Also, the physical nature of pulling the covers on and off can be arduous. This was a problem aching for a solution. 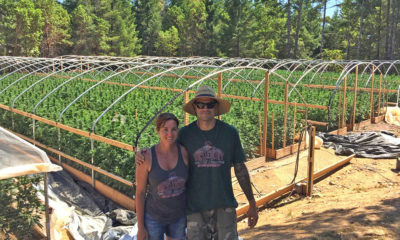 Enter Jonathan Valdman, a Grass Valley grower who saw this dilemma and set out to solve it. In 2006, Valdman visited members of the cut flower trade, who had been using light dep technology for years, and began to discuss how to adapt their technology to growing cannabis. Touring their greenhouses, he was surprised to see that the structures didn’t provide total darkness when covered. “I kept asking them when it was going to get dark and they were looking at me strangely,” said Valdman. Right away he knew that their systems would not work for cannabis, which is much more light sensitive than most flowers. He knew that he had a business idea that he could build on and a product that growers could use. After founding Forever Flowering Greenhouses, Valdman proceeded to design a dark material that could effectively cover his greenhouses and block out all light. He sourced the best motors and hardware he could find to drag the material over the structure and envelope the greenhouse in total darkness. Coupled with timers, which eliminates the possibility of human error, the structure covers would be fully automated to cover and uncover the greenhouse tops at 12-hour intervals. His next innovation — and probably the most important one — was to create a triple layer blackout cloth that allowed air to circulate yet still completely blocked out all light. “I realized that without adequate airflow, humidity was going to continue to be a major limiting factor,” recalls Valdman, when discussing the “aha” moment he had which led to the development of their triple layer breathable blackout fabric. Now air could flow through the walls and roof of the greenhouse, but light would not. In early greenhouse structures (from hoops to hard sided) one of the major challenges in growing connoisseur-grade weed has always been managing high humidity. Since structures are fully enclosed, humidity levels can often soar as high as 85 percent, which can adversely affect bud quality. Growers traditionally will utilize all manner of fans and ducting to lower humidity to a much more acceptable 40 to 50 percent. Valdman’s new material allows air to circulate through the covering cloth, creating a comfortable growing environment for plants. The cosmetic appearance of flowers grown in greenhouses manufactured by companies like Forever Flowering Greenhouses often allows cultivators to command as much as $2,000 per pound, rivaling indoor prices. While Valdman and his crew produce the Rolls Royce of the greenhouse industry, many other growers are achieving great results using simpler technology. In the end, the skill of the grower matters as much as the technology employed. All over the West, crafty growers have adapted to their terrain and are producing world-class flowers with simple equipment. A grower’s intrinsic knowledge and experience in knowing how to read their plants needs and respond appropriately is at least as important as the technology. Couple skill with the technology and the results speak for themselves. As greenhouse tech develops and growers add more techniques from indoor growing, including smaller plants and supplemental lighting, the cosmetic quality of their buds increasingly rivals that of top quality indoor. Cannabis, whether grown indoors, outdoors or in greenhouses, should be judged on its own merits and not be stigmatized by where or how it was grown. Greenhouse tech is advancing swiftly each year. Look for the future to be more and more about automation, as greenhouse designers and growers create bigger and more efficient structures. An interesting sidenote is that even in legal states with far more expensive tech than hoop houses, the quality of cannabis is still directly related to the skills and passion of the people tending it. In some of the larger operations, which have many employees, the quality of the final product is not as good as some dedicated Cali hoopsters produce. That’s not to say if these same growers had access to more elaborate and much more expensive tech that they wouldn’t do even better. Cannabis is a distinctly sensitive plant and it reacts to the energy of the people that produce it. As more professionals join the industry each month and breeders continue to perfect their art, we will see much more top quality greenhouse hit the marketplace. This change bodes well for both the consumer and the environment. Have you smoked any top-quality greenhouse buds lately? Tell us about your experience.